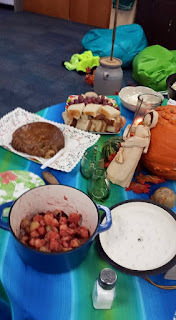 1st grade students have been learning about the pilgrims. From their research they constructed an alphabet book using our computers and their hand illustrations. Learning about something is not the same as experiencing and understanding it. So our cleaver 1st grade teachers in conjunction with the library designed centers to let kids see what it would feel like to live in the 1600s. First we turned out the lights and used candles (the oil lamp seemed a bit too flammable for comfort). We started the morning in the garden harvesting root vegetables. Back inside they learned to clean them, write with a real quill pen, sew using cards and shoelaces, take pop corn off the cob and prepare it for popping, and make butter. 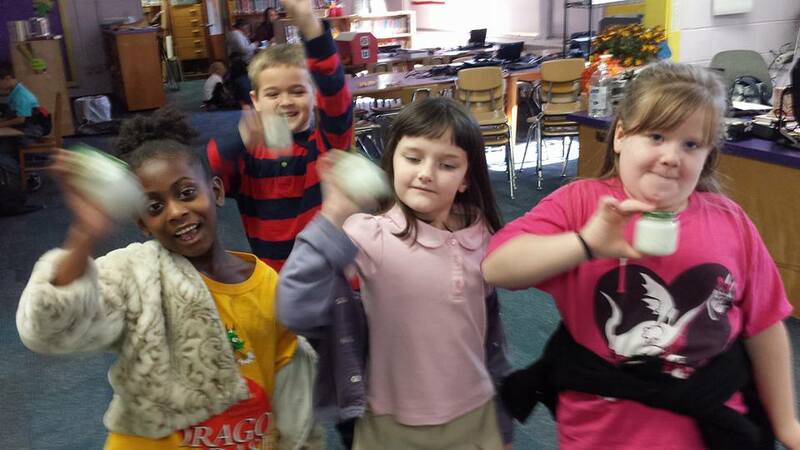 They also got to go on a virtual field trip to Plimouth Plantation. The Tennessee Agricuture Museum has a great box filled with things that would have been used in colonial America and the kids had an opportunity to handle them and ask questions. After lunch the students got to sample the feast we made from their harvest that morning. These children ate what I imagine was their first beets, and they declared them good. We added Indian pudding made from cornmeal and molasses, apples, and homemade bread on which they liberally spread the butter they made. Some liked the butter so much that they asked if they could just eat the butter! We started the meal with a prayer that the pilgrims might have used and a chorus of "We Gather Together." It was a joyfilled day and one that the children will likely not forget. This kind of learning is hard to measure and even more difficult to understand! You can experience some of the things they did by using our Live like Pilgrim Page. One of the joys this year in the Library is weekly visits by Otter our reading buddy. 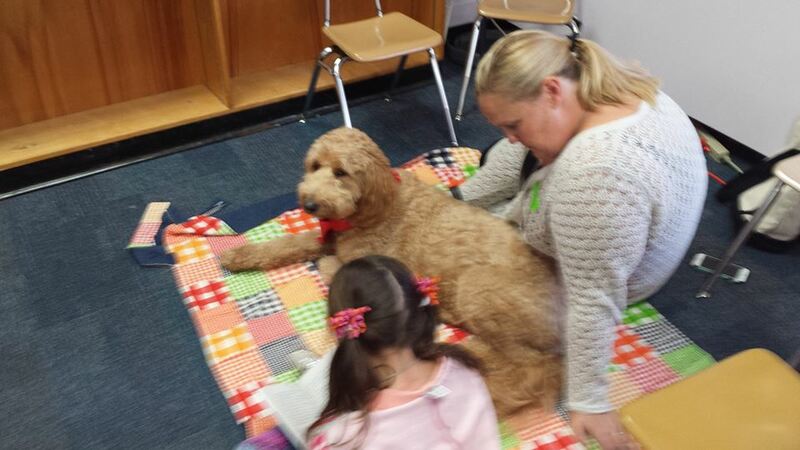 He is part of a national program, Paws for Reading , in which children read to a therapy dog. The dog makes no judgment as to the fluency or accuracy of the reader, but the dog's human partner does. I hear her hearty laughter at the silly stories that many children love to read. The warmth of that laughter says,, "I am enjoying your reading. You are a becoming a capable reader and I look forward to hearing you each week." Otter, after just a couple of weeks, recognizes his friends which also provides a positive message to the kids as they respond with joyful giggles, hugs and yes sometimes even a lick or two! 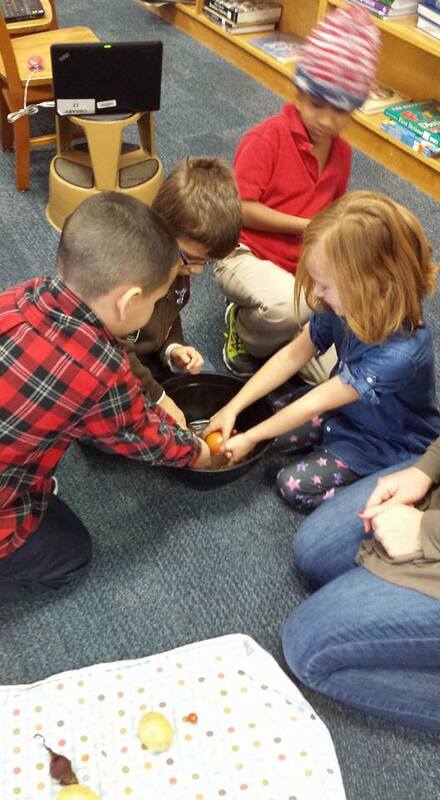 We are blessed with faculty members who find exciting things for their children. This particular program was brought to us because of one such kindergarten teacher who loves animals and children. Her persistence reaps benefits every Thursday as children cycle in and out reading to and loving Otter. Lest you think that reading to a dog is silly, let me point you to research found on the Paws website.